On April 4th, 2019, the CN Tower in Toronto, Canada will light up in blue to celebrate the fourth annual Global Meetings Industry Day (GMID). GMID is an international day of advocacy that highlights the proven value that business meetings, conferences, conventions, incentive travel, trade shows and exhibitions bring to businesses and the economy. The Meetings Mean Business Canada (MMBC) board members and leaders from across the meetings and events industry will be celebrating cross-Canada for the fourth annual Global Meetings Industry Day (GMID). According to the recently launched Global Economic Impact Study, Canada ranked in 6th position out of 50 countries within the business events sector. Within Canada, this means direct spending of over $33 Billion, $19.3 direct GDP along with the creation and sustainability of over 229,000 jobs. The meetings and business events industry is an important economic driver. The CN Tower will light up in celebration for this immense success of the meetings industry whilst shining a light on important advocacy work carried out by the Meetings Mean Business Canada coalition. “Meetings Mean Business is all about highlighting the power of what business meetings, conferences, conventions, incentive travel, trade shows and exhibitions collectively do for people, businesses and communities across Canada. This business community provides the stage for personal relationships that are the core of every business decision, and face-to-face business events provide professionals with that personal interaction, which leads to deeper relationships. Furthermore, these meetings and events provide a platform for developing a strong workforce, educating the membership and advancing innovations that matter to Canadians. That means that meetings and events provide a critical source of business revenue, jobs and taxes. They stimulate legacy investments by funding social projects & community initiatives. Outside of the results driven by business meetings, the events and meetings industry creates hundreds of thousands of jobs, generates billions of dollars of revenue and supports communities across the country.” said, Heidi Welker, Chairperson of Meetings Mean Business Canada. GMID was created in 2016 to raise the profile of the meetings and events industry, and last year, involved meeting professional organizations, association chapters, corporations, destinations, elected officials and business leaders. “It is very exciting to have the most iconic Canadian structure turn blue in support of GMID. 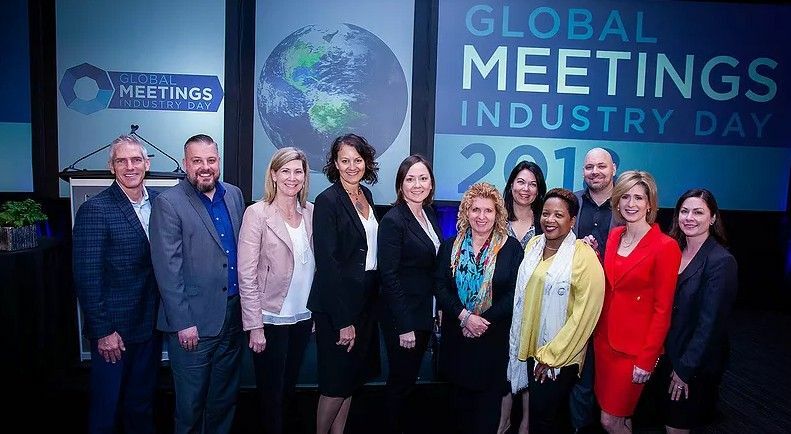 Global Meetings Industry Day is a great time for everyone to come together to celebrate the impact of face-to-face meetings on our Organizations, our Teams, our Communities and on our Country,” said Jennifer Spear, Director MMBC, Chair GMID Committee.